A valid, signed US passport. 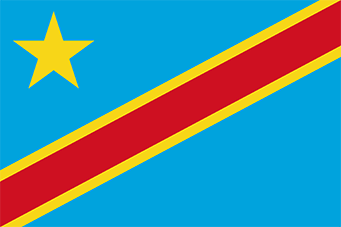 The passport must have at least 6 months remaining after the completion of your stay in the Democratic Republic of the Congo, and contain at least one blank visa page. A letter of invitation from a tourist agency or private host in the Democratic Republic of the Congo. This letter must be notarized at City Hall in the DRC and either be legalized by the DRC Ministry of Foreign Affairs or submitted with a formal declaration of liability “engagement de prise en charge” issued by the Direction Générale des Migrations (DGM).If the tourist is not using either a tourist agency or private host, then, they need to provide a letter stating the purpose of the trip, the site the tourist plans to visit and the duration of the trip. This letter should be notarized by local authorities in the U.S. and be submitted with a declaration of liability “engagement de prise en charge” issued by the Direction Générale des Migrations (DGM). Company signed letter explaining the purpose of their trip and providing a financial guarantee. The letter must bear the original pen-to-paper signature of a company representative other than the applicant. A letter of invitation from the company or partners to be visited in the Democratic Republic of the Congo. The letter must be on company letterhead and signed by a representative of the company, and should include the applicant’s name and the name, address, and telephone number for a contact person at the overseas company. This letter must be notarized at City Hall in the DRC, it must also be legalized by the DRC Ministry of Foreign Affairs and submitted with a formal declaration of liability “engagement de prise en charge” issued by the Direction Générale des Migrations (DGM). NB: Congolese nationals with dual citizenship are not required to present an invitation. The Embassy reserves the right to deny visas to all requests it deems incomplete or unclear. Applicants must pay a non-refundable $25 application fee. In addition applicants must pay a non-refundable visa processing fee when submitting an application. See processing fees of for each visa types below. No refund will be granted. Fees are waived for diplomatic and US official visas. The fees are waived for diplomatic or official visas. Office hours: Monday to Friday 9 AM to 5 PM except on holidays.